590 pages | 28 B/W Illus. "Purvis’s biography is also a drama. 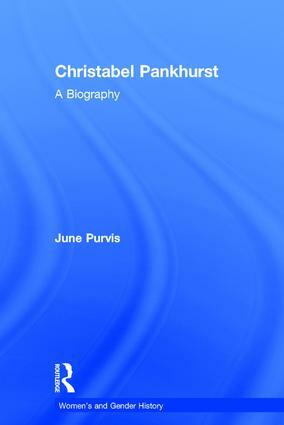 Her presentation of Christabel’s life as a sibling rivalry within a celebrity family drama, whose protagonists' voices call to each other across the archives, makes this work of academic significance a compelling read…"
"Purvis has provided an exemplary and detailed study within the context of the wider Pankhurst family, in which some attention is devoted to Christabel's life after suffrage. (…) This immensely detailed biography asks us (…) to think about the ways in which we judge women who take part in radical politics (from all sides of the political spectrum)." June Purvis is Emeritus Professor of Women’s and Gender History, University of Portsmouth, UK. She has published extensively on the suffragette movement in Edwardian Britain, her Emmeline Pankhurst: A Biography (Routledge, 2002) receiving critical acclaim. She is the Founding and Managing Editor of Women’s History Review, the Editor for a Women’s and Gender Book Series with Routledge, the Chair of Women’s History Network and the Secretary and Treasurer of the International Federation for Research in Women’s History.